The Chicagoland Bicycle Federation has announced that it has expanded its mission and will now operate as the Active Transportation Alliance. 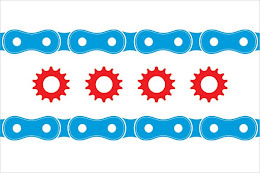 For over 25 years, the Chicagoland Bicycle Federation has been a model civic organization. The CBF was visionary, a strong advocate and fun. As a result, the CBF was able to keep up with the popularity of biking in Chicagoland and effectively change the biking culture in Chicago. Those are some big accomplishments, and while there is some initial dissention in the ranks that the CBF should remain "as is", I think the CBF deserves the benefit of the doubt. The Active Transportation Alliance will expand on the CBF's mission and work to increase the safety for pedestrians in Chicagoland and advocate for affordable, reliable and safe public transportation. The author of this blog, Mike Keating of Keating Law Offices, P.C., is working with the CBF/ATA to push the initiatives of the Illinois Legislature's Distracted Driver Task Force.